Fall Fashion Week is a thing. September 8th was our much-anticipated fall fashion event at Arc’s Value Village. Our team of personal shoppers (aka the Thrift Stylists!) hosted Ali & Harmony Kaplan (aka the Shop Girls of myTalk107.1) in our Richfield store for an afternoon of shopping. Unlike our spring event, where our stylists collaborate with our models for a runway show, this event was interactive and allowed our guests the opportunity to have a quick personal consult and get ideas on creative outfits for Fashion Week Minnesota, Fashionopolis, and summer-to-winter transitional pieces. 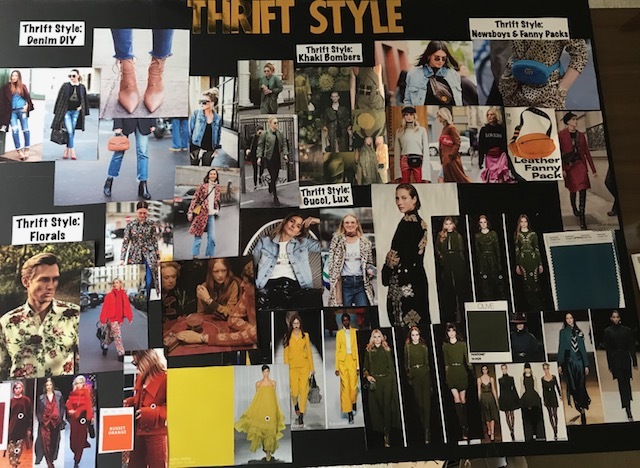 I put together an inspirational mood board for the event, pulling my aspirational looks from the thick September issues of fashion magazines and compiling them to tell a visual story. Colors of this season include russet orange and pear red of course, with Ceylon yellow being the bold outlier this year. 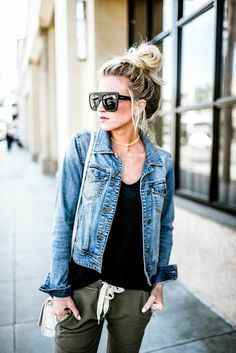 What struck me about the fall fashion was the consistent display of olive green and also distressed denim. The Hadid sisters were captured in olive green street style that ranged from the bomber jacket to jogger pants. 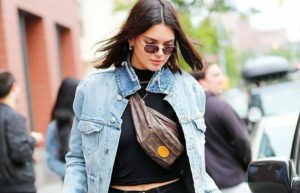 The Kardashians wore high-low Gucci paired with distressed denim and fanny packs. Runway models slung fanny packs cross body over luxurious velvets and jewel-encrusted couture inspirations. 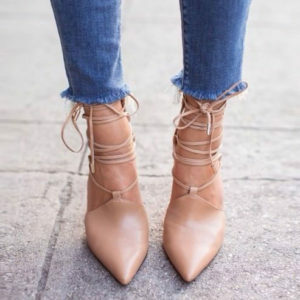 Anna Wintour, Vogue Magazine’s Editor-in-Chief and Chief Fashion Influencer, said it well when she proclaimed in the September issue that “what we wear needs to reflect the times it’s being created for” and I couldn’t agree more. These are new times; unpretentious, comfortable, budget-friendly, and village-friendly altruistic. Outside of glossy magazines and classic movies, we have cashed in our chips and loosened our ties. Thrifting reigns supreme. Individuality is the new leader, and saving money is the new currency. Classic pieces like the olive bomber jacket and distressed denim are things that Arc’s Value Village excels at. There is no right way for distressed denim so go ahead, buy a pair for $1.59 (Sunday tag sale price) and make them your own. You’ll be glad you did; your money supports your neighbors with disabilities and recycled fashion keeps Mother Nature happy! That is a great reflection of the times! It’s going to be a great autumn. Happy Thrifting!